The once-upon-a-time architecture student in me is loving this. 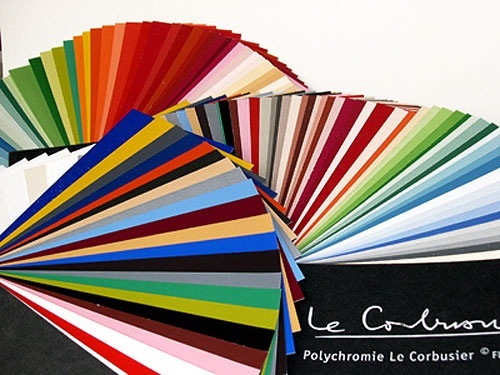 Derived from the color theories of Le Corbusier, Swiss paint manufacturer kt.COLOR produces an exclusive collection of interior paints in colors the late architect (painter, writer, furniture designer…) described as “eminently architectural”. Particularly unique about these paints are the pigments used to make them—the actual source of the colors. Considered classic artists’ pigments they’ve been used on canvases for centuries but aren’t typically found in architectural paints. Le Corbusiers “eminently architectural” colouring materials are used for their ability to define space and for their ability to build bridges to other sensory experiences. On this level they remind us of the sea, a dusty rose, dusk, filtered light in the forest, sunwarmed bricks, the music of a cello or a saxophone, red velvet curtains, or early morning haze. Smells, pictures, memories and experiences are evoked by this group of classic artists pigments. All of them have been used for their ability to breathe life into two-dimensional reprentations on canvas, murals and surfaces throughout our cultural history. This ability to breathe life into space makes them so useful to the architect.